Don't chew on my Jimmy Choos! by The Pawsitive Packleader, Inc. Drive Behavior in Dogs When it comes to the lives of our dogs, perhaps the most crucial concept to understand is their need for activity. While working with a client on a problematic behavior, I first have to ask, “What do you want your dog to do instead?” Quite often the reply is, “I just don’t want them to do ‘that’.” This invites what my mentor refers to as “dead dog syndrome.” Dogs have to do something, and even if they cannot do their chosen behavior, they must have something to do instead. If your dog has the favorite activity of chewing on your shoes, keeping your shoes off the floor is only a start to the solution. Your dog must also then be given something they can chew on—like a rawhide. Expecting your dog not to chew is not a possible solution. If your dog scavenges food off the counter, keeping food off the counters is only a start to the solution. Your dog must also then be given an activity where they can scavenge—like a work-to-eat puzzle or a nose work class. Expecting your dog not to scavenge is likewise unacceptable. I recently had a Seattle client who contacted me because they were acquiring a puppy. They were not a first time dog owner; however, they owned a very beautiful, very feng shui home. For those who are unfamiliar with the practice, feng shui is a Chinese ideology with a system of laws considered to govern a spatial arrangement and orientation in relation to the flow of energy. I had set them up with a long-term and short-term confinement area, a potty training plan of attack, talked about ABI (see related article: Razor-fanged puppies), socialization and training: the works. Despite my emphatic efforts, the client never acknowledged the necessity for a puppy to explore and interact with the environment around them, even if it resulted in any alterations to the feng shui energy of the house. As the training continued it became painfully obvious that the client wanted a “dead dog.” Their previous dog was a couch potato with a broken growth plate on his femur and sadly this was perfect for them. Every day the dog went to day care (which is in fact where the dog broke his femur—an injury which lead to multiple complicated surgeries and eventually his euthanasia), after work they brought him home from day care and then the dog would crash for the evening. This could not be further from their new puppy, an adorable firecracker of behavior and curiosity. It was not long though until the laws of the feng shui home began to harm the psychological development of this puppy. Everything the dog tried to investigate was pulled out of his mouth. The majority of his day was spent in two rooms with the rest of the house off limits. When outside in the yard the puppy was not supposed to eat any plants or play in the dirt. The “dead dog” lifestyle was so frustrating that even with constant guarding prevention exercises, guarding behavior not only emerged but also reached red-flag status in just a month. This happened when a colleague of mine was bitten for approaching the puppy when he was trying to dig in the yard—an explicit “no-no” from the owners. The bite resulted in no puncture wounds or broken skin thanks to very successful bite-inhibition training that I had installed, however that doesn’t change the color of the flag. I had to sit down with the clients and give them two options: they either change the rules of the house and let the puppy have more room to explore and interact with the environment around him or they re-home the puppy. Most regrettably they chose the latter and the puppy has moved on to a new family. Dogs must be allowed to behave and owners must get it out of their heads that dogs behave good or bad. They do not have moral objectivity to the outlets of their needs: they just have needs—period. Dogs must be allowed to chew, scavenge, dig, and dissect should the desire arise in them. Depriving a dog of any single innate behavioral need will only lead to anxiety and mental duress. I have written the subsequent articles on behavioral tendencies that are often referred to as “drive behavior.” I have given this lengthy introduction to impress upon anyone reading that when you invest in a dog—in the life of a non-human animal—they have non-human needs that do not always jive with our feng shui lifestyles. 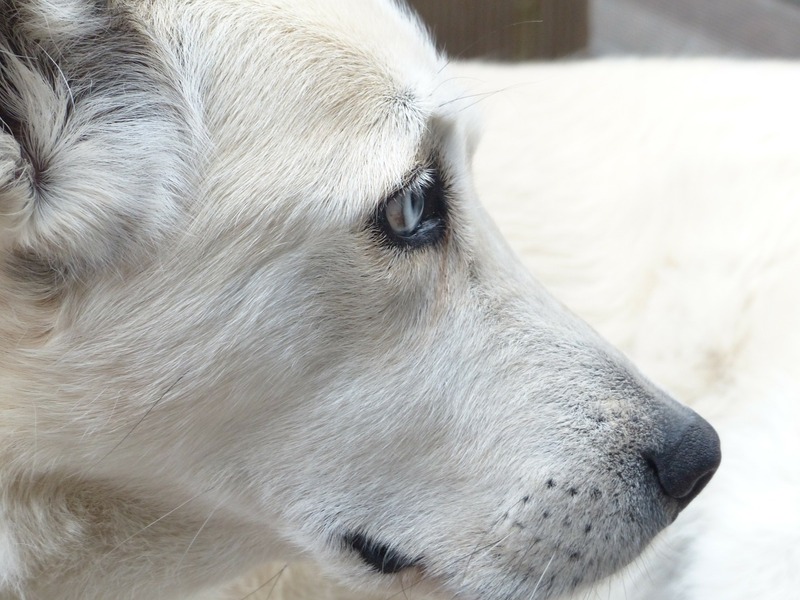 If these needs are not met, dogs will deteriorate both mentally and physically from stress. While the ancient principle of post hoc, ergo propter hoc (after this, therefore because of this) is correlational, not causational, it is imperative to understand that dogs are euthanized daily because of behavioral problems that arise from anxiety related issues. Dogs are filled with all sorts of behaviors. Some dogs are quiet, others boisterous, while some are downright goofy clowns. However, despite these differences in temperament, all dogs display common behavior that we call “drives.” They are so common that they are constantly the subject of stereotypes in comics, movies, and stories: chewing on your favorite pair of shoes, knocking over the trashcan, digging war-size bunkers in your yard, ripping every ounce of stuffing from the living room pillows, barking at nearly anything that moves. They are called drive behaviors because dogs are literally driven to do them. The behaviors are hardwired into their doggie-genetics because they are essential for survival. Dogs are not alone, in fact, every animal caries adaptively significant behavior (see related article: “Spay and neuter: a touchy subject”) that is essential for their survival. Humans look for food, shelter, water, safety, social groups, exercise, all so we can find a mate and pass our genetics along. We don’t think in such base terms (and dogs don’t really think in any terms), but the most essential quality of genes is they want to move along, riding the immortal bus of procreation. Dogs have six main drives: chewing, scavenging, digging, dissecting, hunting, and barking. Some dogs will display every one of these drives while others show maybe one or two of them. The drives that a dog displays is based on breeding history and temperament and as I have mentioned before, it is imperative to offer your dog an environment where they have an outlet for their drives. Chewing is at the top of the list because it is undoubtedly one of the strongest drive behaviors. Chewing is essential to maintain strong and healthy teeth and jaws, thus it is critical to a dog’s survival. While this behavior is important, most people would prefer to keep their Bruno Maglis or Jimmy Choos out of their dog’s mouth—talk about expensive taste. Naturally we also want to discourage chewing on furniture, carpeting, and walls by offering a dog the chance to chew on legal items. Many people decide to tackle the problem by extinguishing the behavior completely. This is a very bad idea. Dogs have to chew. A dog that is not allowed the opportunity to chew on something appropriate will either take matters into their own hands (or jaws—usually for the worse) or will begin to have affected mental health due to frustration and stress. Bully sticks, nylabones, cow femurs, Kongs, and rawhides comprise a short list of the hundreds of available items that are far less expensive then a new coffee table or family room couch. If any drive behavior could battle the desire to chew, it is the desire to scavenge. Scavenging is a very strong drive in dogs and for an excellent reason. Better scavengers live longer. Thus it is normal for a dog to decide to see what lies in the trash that the humans felt was not worth eating at dinner or checking out the counter-tops that often have tasty morsels ripe for the plucking. A dog would not be a dog without being born with these genetic tendencies so it is crucial to help them find outlets for their doggie-desires. In the last couple years an increasing amount of puzzle toys (or “work-to-eat puzzles”) have exploded with success on the dog-market. While they vary greatly in design they all have one thing in common: inside is food and the dog has to manipulate the toy to get the food to dispense. These are fantastic toys to help satisfy scavenging urges and they are tools that every dog owner should have in their toolbox. Some dogs who are unfamiliar with toys like these don’t necessarily leap at the first one you give them, so be flexible and experiment with a couple different types and find out what your dog likes. After all, behavior is behavior, working is working, and because no two animals have identical levels of motivation do not assume your dog wants to solve a calculus problem for a piece of kibble. My favorite three work-to-eat puzzles are the Omega Paw “Tricky Treats” ball, the Busy Buddy “Tug-A-Jug,” and the Starmark “Bob-A-Lot.” The Tricky Treat Ball is a round ball with a hole in one end that the dog must roll around to get food to dispense—perfect for any ball motivated dogs, the Tug-A-Jug is a canister type toy with a small hole and a rope that the dog has to manipulate to extract kibble out of—perfect for the rope and tug motivated dogs, and the Starmark Bob-A-Lot is the “blow-me-up-punch-me-clown” of the dog toy world—a great puzzle for dogs who are just gaga for funky toys. The Bob-A-Lot puzzle works much like the tricky treat ball but in a punch-me-clown fashion, the toy bobs back up every time it’s whacked. Dogs have to knock the toy to one side and roll it in order to extract the tasty yummies. Puzzles like these will not prevent scavenging behavior, but they will certainly lower their frequency in illegal areas provided you haven’t given your dog a lifestyle of fresh chicken sitting on the counter. While this is a great reason to own any or all of these products, the best qualities of these toys are that they provide tremendous mental stimulation, which works to lower a dog’s anxiety. If you are leaving your dog at home, filling a toy up and leaving it for them is wonderful protection against separation anxiety—far superior to the feeble attempts of verbally reassuring your dog that you will “be back soon.” I mentioned three products I am particular to, but there are literally dozens so experiment and see what your dog likes. If you get a toy and your dog won’t touch it, take it back for another or give it to a friend to try with their dog. Be sure you give your dog some time to try out the new puzzle-toy as some dogs take a week or two to warm up to the idea of scavenging their dinner from a plastic toy. We have now discussed the chewing and scavenging drives—next we come to digging, and dissecting. While digging is not a strong drive in all dogs, others find their favorite hobby rearranging the geographical layout of the back yard. For these dogs you have two options; either let them have cake and dig away or designate a legal area for a digging pit. A digging pit is any designated and marked area that the dog is allowed to dig for China in. Now it takes more than a chat over a cup of joe to teach your dog to recognize where they are supposed to dig, especially when the back yard is filled with so many favorite spots already. The easiest way to train a dog to use a designated digging pit is two fold. First, you have to designate and prepare an area for the pit. For both function and aesthetic, I head to Lowes or Home Depot and load up on some garden rock for one to two dollars a rock. The size of your dog will determine how big the pit needs to be, however a 4’ x 3’ box is pretty sufficient for most dogs. Remember the box doesn’t have to fly; it just needs to mark the area so both you and your dog can remember the exact spot that is legal for digging. When it comes to dirt, their nose is going to be stronger than our eyes and it’s imperative that we are always able to be consistent. Next, grab your shovel and/or rake and loosen the dirt a little and bury their favorite bone just beneath the surface. This almost invariably draws their digging urges out to the place you have legalized. The second part to teaching a dog where to dig is management. Do not let the dog have free reign of the yard without supervision. When you see him or her starting to paw or dig outside the digging pit you must interrupt and redirect them to the digging pit. With patience and consistency your dog will learn that the only place they can dig in peace is in the digging pit. Not only will Fido love their new playpen but you will also be happier without worry about coming home to a digging frenzy that claimed the living room couch as a casualty (don’t fall for the doggie-excuse, “I was just looking for loose change”). Dissecting is exactly what it sounds like; taking the contents on the inside of something and removing them into a charming pile of proud mischief. This behavior is pretty common and it is perfectly understandable. How else would a dog eat an animal in the wild? Though dogs and wolves are carnivores, they consume a lot of predigested plant material from the contents of an animals stomach which is incredibly nutritious. [Side note: There is often a debate about whether or not dogs are carnivores or omnivores because they will forage on plants as well. However, they do not produce amylase in their saliva or have a grinding molar action in their teeth, thus these plants they'll eat are not typically absorbed at all.] Simply by the nature of the behavior, it is impossible to mimic this without actually pulling something apart. If you go to a goodwill store you can usually find lots of cheap plushy stuffed animals or dog toys for a dollar that are perfect for letting your dissector get his or her drive out. Be sure that you take a moment to remove anything that’s potentially harmful from a dissectible toy (eyes, buttons, etc.). There is a caveat to this—some dogs are both dissectors and ingestors. These dogs will begin dissecting the same way but instead of leaving a nice little pile of mayhem on the floor they will swallow everything. My dog is an ingestor so he cannot be left unattended with anything he can take apart. He has ingested everything from the contents of his dog bed, to tennis balls, to his hard plastic Tricky Treat Toy ball—the motivation for swallowing plastic and rubber I may never understand but I don’t have to, I just have to appreciate it. An important thing to remember with all drives is that allowing a dog to deplete their energy with one drive can mitigate the need for another drive. For example, since my dog is an ingestor, he is bombarded with chewing, scavenging and hunting opportunities to lower his intensity for dissecting and then ingesting. If you have an ingestor be sure that you have plenty of chew-items he can ingest (like rawhides) and work-to-eat puzzles. The last two drives are the hunting drive and the barking (or herding) drive. Hunting is not as scary as it sounds; however, every dog is equipped with a drive to hunt (whether they know it or not). This is a drive that must be taken advantage of in legal outlets. Fetch, Tug, and wall ball are tremendously effective at satisfying this drive and draining other drive behaviors as well. If you don’t give legal outlets, you run the risk of joining the ranks of dog owners who have dogs that chase runners, cyclists, running kids, cats, squirrels, cars, and anything that is moving away from them. Dogs do not really think about it either. Like all other drives, it’s an instinct for survival. When they see something moving away from them there is a section of their brain devoted to predatory species-specific behavior. It seems to be most easily triggered by things smaller than 50% of the dog’s size, however a desperate hunter will chase just about anything moving away from them. You may have heard your friends or veterinarian saying, “never play tug—it leads to aggression”. This is statistical and biological nonsense. Because dogs are so rambunctious at times (and even more so for some during a game of tug), it is common for them to need to learn some self-control with their arousal and so there have to be rules for the game. Without this training, which is quite simple, dogs have been known to bite a hand or finger now and then. This gets calculated into bite statistics leading to the conclusion that tug causes aggression (see article: Breed-specific legislation: a closer look at the evidence). In addition to this, people are also very sensitive about hearing their little furry predators make vocal noises. Growling is a perfectly normal part of play behavior, however if you are concerned with the vocalizations that your dog is making, do not hesitate to contact a professional. On top of all the brilliant drive energy that can be depleted in a game of tug, it is also one of the absolute best ways to teach a dog arousal control and jaw prudence—amazingly at the same time! However, tug must have three rules in order to teach these effectively. Rule #1: The human initiates this game. If the dog initiates, the tug toy disappears and does not come out until the next day. This is not because of “dominance” mis-ideology; this is purely for precautionary safety. Should a child ever accidentally pick up a dog’s tug toy or be holding something that looks like a tug toy and not realize what the object means to the dog, they could suddenly be knocked over and potentially injured. Plus, one of our goals is arousal and impulse control, so ask your furry predator to hold his horses until you are ready to play. Rule #2: Should any teeth come in contact with human skin the game ends immediately and the tug toy disappears until the next day. Dogs are as sensitive with their mouths as we are with our hands, so the implication that a dog didn’t know they touched human skin with his or her teeth is like claiming ignorance when you stick your finger in the wedding or birthday cake for a quick lick. You know exactly what you did, and so do our dogs. Rule #2 is great to both reinforce jaw prudence learned as a puppy as well as to teach an older dog the skill if it is lacking. Skills must be maintained, and jaw prudence is essential in a world that is not afraid to euthanize a dog just because of their appearance—let alone their behavior. Rule #3: You should be able to say “drop” at any point in time and have an immediate response. Once the dog has learned “drop” and they ignore it, the tug toy disappears until the next day. This is easily trained by using a piece of food on the end of the dog’s nose when you say the command. They will spit out the toy PDQ in order to eat the tasty treat on the tip of their snout. Soon as they swallow, they get the tug toy back immediately and the game continues. When you train tug correctly, not only does their “drop” command become lightning quick, but they will also back away should you slip a finger between their teeth. It doesn’t take very many repetitions of enforcing the tug rules for a dog to become an avid but polite tugger. Barking is a drive that does not refer to general noisy barking behavior (such as alert barking). When barking is a drive behavior it is most often displayed (or rather heard) in herding breeds like cattle dogs, Australian shepherds, shelties, collies and border collies. It is always initiated towards a moving object—people, children, other dogs, cars, and even airplanes. These working dogs have a strong history of being bred for herding, thus when something moves, they have a strong desire to direct its movement. Or, vice versa, if something is not moving (such as my hand into the treat pouch), they will bark in a very 'demand' kind of fashion that is not only potentially annoying but also indicative of poor impulse and arousal control. If you have a herder, the best thing you can do is teach them to herd. Sheep herding trials are tough, highly competitive and extremely fun. Short of owning sheep for these dogs to herd, you must take every initiative to give the dog outlets in as many other drive activities and offer the dog plenty of exercise. Herding behavior in general is a domesticated version of the predatory sequence—search, stalk, rush, chase, but don’t kill, dissect and consume—so it is important that this drive does not pop up in illegal outlets (such as nipping at children). Seattle is a wonderful place to own dogs for so many reasons, but one of the best is that there is simply so much available here for our dogs. Nose work is a wonderful activity that I cannot recommend enough for all dogs. In nose work, a dog must simply find a hidden piece of food in a small area. It helps build confidence in shy dogs, it gives a fantastic outlet for scavenging behavior, and best of all it is really easy! Of course as with anything there are advanced levels, but basic nose work is fun, easy, laid back, offers tremendous brain stimulation for Fido and also builds great behavior recognition skills—since the whole time a dog is working you are staring at their behavior (essentially what a behaviorist does on a much larger scale). Ahimsa Dog Training in Ballard offers nose work classes on a friendly drop-in style as well as Companion Animal Solutions in downtown. Another great activity for dogs, and in particular the herders, is Treibball (pronounced “try-ball”). In Treibball a dog learns to move inflatable exercise balls much like he or she would herd sheep. The dog learns start, stop and directional commands and moves the balls around in a similar way you would tell them to move sheep around. Treibball classes are conveniently offered downtown at Companion Animal Solutions as well. If you are interested in an extremely challenging sport for your dog, Mondio Ring (or “World Ring”) is a sport that combines French Ring, Belgian Ring, Dutch KNPV (Dutch police-dog training), and German Schutzhund into one mega-sport. ProDog Northwest is a Mondio club that is home to Seattle—for more details contact them on Facebook. There are dozens of activities for you to do with your dog, all of which can be done in your backyard. If you have a dog who is reactive and not suited for a classroom environment—order a book and read up on an activity that sounds like something you and your dog would enjoy. There are hundreds of books encompassing all skill levels of dog sports. By keeping your dog mentally active through drive outlets and sports, Fido will be happier, more obedient, and live with much less anxiety. You will learn more about your dog and they will learn more about you—thus you will both share a deeper, more profound relationship than the owner who only walks their dog around the block a couple times a day.